Guttenberg Industries located in Garnavillo, Iowa - Guttenberg Industries, Inc.
Guttenberg Industries, Inc. officially opened a new office in Garnavillo on Nov. 23, following the July groundbreaking on the 8,000 square foot structure. All departments are now located in Garnavillo, just a few steps from the 70,000 square foot factory. “That ten miles could be a long ten miles,” said president David Kreul with regard to the years of commuting between Garnavillo and Guttenberg campuses. The new office space allows enhanced communication, faster decision making, and overall greater efficiency among employees. It also features two conference rooms, a large lunchroom that doubles as a training room, and many windows with pastoral views of the surrounding farmland. 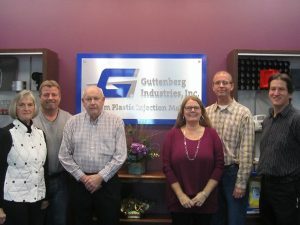 Guttenberg Industries celebrated 40 years in business last year, and also celebrated 20 years at the Garnavillo location in 2015. After the decision was made to move company headquarters from Guttenberg to Garnavillo, the vacant building was dismantled and recycled for use by other businesses and community members. 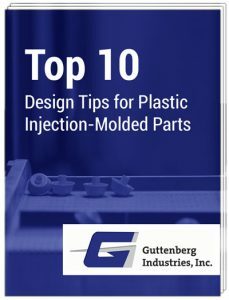 The company manufactures custom plastic injection molded products for a diverse group of customers serving broad markets that include childcare products and toys, plumbing products, automotive and agricultural components, consumer packaging, electronics devices, and more. Annual sales are approximately $18 million, providing 120 full-time jobs to the community.